For decades clothing, athletic and even technology brands have trained us to expect innovation, quality, inspiration, and purpose in our favorite products and devices. These companies constantly push cutting-edge design and style to be a valuable aspect of their products. This is why people covet Apple products, Nike sneakers, or Tesla's cars. Why shouldn’t you expect the same out of the design of your home? Why settle for a house designed by a builder rather than Architect? Why do people value old houses designed for a different time and lifestyle, than contemporary design that addresses how people live today and incorporates the latest systems, technology and materials? For many people the previous statement is challenging. Most people have not and never will seriously consider hiring an architect to design a home that inspires them or is customized to address their lifestyle. Most will never own a home that is an extension of themselves and their family. And many still prefer antiquated styles rather than contemporary architecture, mostly because that is all they see on the market. One issue is that a custom designed home is out of reach for many people, just like the new $1,000 iPhone X, a custom pair of Nike VaporMax, or a Tesla Model S is financially out of reach. We believe that architecture is actually a lot more accessible than people believe. We will be posting a follow-up article soon about the costs associated with custom homes. At Propel Studio we strive to offer innovative design to people of all income levels. Our work on custom homes has ranged from small urban infill for middle and working-class families, to contemporary houses in Portland’s West Hills. Regardless of the budget, we try to find creative design solutions to create innovative architecture that responds to the unique needs and lifestyles of our clients. We want to make contemporary design available to everyone and show the value that a well designed modern home can offer. Have you ever wondered what a home ‘should’ look like? Rather than start with a specific style or aesthetic, why shouldn’t the design of every home be an exploration into how it feels, how it interacts with the environment and what the implications of all the materials inside and outside are? In our view, every decision that’s made, every detail, every texture and color should be an authentic reflection of our client, the homeowner, and address the context and climate in which it lives. Our firm isn’t limited by a set style, but rather with each project we set off on an exploration of how a building can best serve the end users. There is a famous saying that “form follows function.” We strive to follow this doctrine but add that a great work of architecture needs to also be beautiful. We love to work with clients who want to push the boundaries beyond what they see on HGTV and we understand what their home means to them and how it enhances and supports their lifestyle. We find that the best architecture comes from the best clients. Our best work is a result of great collaborations with the people we are designing for. We like being challenged to come up with creative solutions that are both functional and beautiful. We believe that high quality doesn’t have a specific style. We believe there’s beauty in design that responds to and performs in its natural environment. We believe the most sustainable building is one that is loved by and cared for by it’s users for generations to come - that sustainable architecture must be high-performance as well as beautiful, durable and timeless. We believe in the value of making the right decision for the long-term. These are the values that direct our design process and the conversations we have with our clients. If you’re interest in building a great home that meets your needs and unique lifestyle, we’d love to talk. Our goal is to help you wake up in a place where you know you belong, because it’s the perfect reflection of you. A school design orchestrated by Propel Studio intricately focuses on the interior environment, promoting healthy living and nurturing imagination for early childhood development. In their latest design project, Nick Mira and Lucas Gray, partners at Propel Studio Architecture in Portland, Oregon, are at the forefront of where architecture meets sustainable design and healthy living. They are leading the design team for a new Primrose School, a national brand of accredited early education schools committed to childhood development, on the outskirts of Portland in Hillsboro, Oregon. The Primrose School of Hillsboro, is the first project in Oregon for the national brand, and there are plans to create a few more in the Portland metro area. Bringing years of architectural knowledge and sustainable design strategies to the project, Mira and Gray’s focus at the school has been to maintain the exterior aesthetics of the national brand, while developing a healthy and sustainable indoor environment. The mission shared between the clients and design team is to provide a healthy, environmentally friendly, and comfortable space for the teachers, staff, and students of all ages. Specifically, great care was made on specifying materials that are healthy and not environmentally hazardous in the interior space — from ensuring that materials and finishes do not emit unhealthy gases, and using natural materials wherever possible, to sourcing local materials and products. Propel Studio and their consultant team has also made a dedicated effort to implement a highly efficient heating and cooling system, reducing energy consumption and saving the client money on utility costs. For example, Mira and Gray are incorporating radiant floor heating for optimal user comfort. This feature provides a peace of mind—it will keep students comfortable year around, particularly during the cool autumn and cold winter days, the times when parents are most concerned about keeping their children warm. It also limits the need for utilizing forced air and ducting that can often collect dust and and increase particulates in the air - a particular issue for asthma and other respiratory problems. The sustainable lighting strategy starts by incorporating as much natural daylight as possible, supplemented with the best artificial technologies. Mira and Gray emphasize extremely energy efficient lighting and therefore have specified LED light fixtures throughout the school. Moreover, the natural and artificial lighting seamlessly balanced throughout the space, creating a mood of tranquility, allowing for maximum productivity and keeping children focused on learning. Finally, great care has been executed towards the acoustical design of the building, including the selection of finishes that are sound absorbent, further creating a soothing environment for children and allowing for a lively, even sometimes boisterous, environment without worrying about an unpleasant, discordant mixture of sounds. In addition to the classrooms, other areas of the school that received an emphasis on healthy and sustainable environments include the kitchen and the indoor and outdoor play areas. The school’s kitchen is equipped with energy efficient appliances, once again reducing the operating costs and energy consumption. Further, the school will serve high-quality, wholesome, and nutritious food, encouraging health conscious minds for life. In order to encourage exercise, play, and imagination, the team chose play equipment suitable for each age group. In order to spark imagination and promote positive development both physically and mentally, this included giant foam blocks which can be creatively assembled to provide an infinite number of environments. Along with sustainable materials and systems, Propel has worked with the developer of the learning curriculum to prepare for increased technology in the classroom - the future of learning. The school will utilize iPads throughout their teaching methods, and as a result, Mira and Gray have incorporated the necessary infrastructure into their design. They have designed extra outlets for charging many iPads at once, and ensured the wifi and internet systems can fully accommodate for simultaneous videos and downloads. The robustness of the integrated technology should have the school well prepared for future advances in technology as teaching tools. In terms of the school’s design, there is no question: health, safety, comfort, and functionality were the primary focuses. Mira and Gray worked closely with their clients to develop a design that met the requirements of the franchise while incorporating sustainable strategies to create a healthy learning environment. Propel’s focus is always on balancing the needs of the clients, the project budget, and their focus on sustainable learning environments. How Much Will My Accessory Dwelling Unit (ADU) Cost? One of the first questions we get from every client is: How much does an Accessory Dwelling Unit or ADU cost? At the same time, we get a lot of clients that come to us with a budget and ask if an ADU can be built for their available funds. The problem for any designer is that it is impossible to answer that question without knowing more about the unique aspects of the design that addresses the client's needs, wants, and site conditions. However, we thought we should at least share a breakdown of the costs for a recent ADU project to give a realistic guideline for you to base your budget on. Below is a rough construction cost breakdown for a 795 square foot sustainable ADU that was built in the summer of 2015 in Portland, OR. This design has a few unique elements that are reflected in the cost breakdown. The design includes a high performance envelope - typical wall construction with standard BATT insulation, plus an additional 2” of rigid insulation on all the walls, 3” of rigid added to the roof, and a fully insulated slab. We also designed in radiant floor heating with an on-demand hot water system. There was also a couple of unique custom windows that are significantly more than a standard window would be - however they were important to the design and function of the spaces. Finally, this breakdown is for the construction costs and doesn't include architectural or structural design work. The design fees vary depending on the complexity, size and budget of your project. This includes the current Portland SDC Waiver that is expiring in July and all of the individual trade permits. around a 600sf slab area including the exterior decks. Also included excavation for a couple landscaping retaining walls on the property. This includes work needed for the ADU plus a couple of retaining walls needed as part of the surrounding landscaping. 2 custom windows, 3 skylights, 8’ front door with side lite, 8’ two panel sliding door, and a few standard vinyl windows. This is a relatively typical cost breakdown for the ADUs we work on. This isn't an extravagant project, and although there are a few places where the client invested in a bit of a premium (custom windows, skylights, radiant floor heating), the rest of the project is pretty straightforward. I think this is a good resource to base your project's budget on. One thing of note, is that each site condition is different. Excavation and concrete work costs can vary greatly depending on the complexity of the site, ease of access, and amount of fill to be added or removed. Cost can also rise dramatically depending on the exterior siding materials and interior finish materials. There were some unique aspects for the concrete work that drove up the cost and we did have some premium siding materials in certain areas of the exterior. Even then we don't really see the cost of a custom designed ADU dropping below $150,000 when all is said and done. It is also important to consider that a cost per square foot calculation is not a great way to determine the cost of a project like this. With smaller projects, the money that goes towards the expensive parts of a house - kitchen, bathroom, mechanical systems, excavations and concrete - don't get offset by the cheaper square footage of bedrooms, dining rooms and other spaces. If you have any questions don't hesitate to contact us. We are always happy to talk about the unique aspects of your projects and discuss your ideas and goals for a sustainable Accessory Dwelling Unit. If you would like to see some of our other ADU designs click here. When Lucas Gray and his girlfriend, Kristin Slavin, bought a house in Northeast Portland a few years ago, they quickly became involved in their neighborhood. Both have their master’s degrees in architecture, so they approached the Vernon School PTA and offered pro bono professional design services. “We said, ‘What do you want? Is there anything you need professional design services for?’ ” Gray said. As it turned out, the K-8 school had a play area that flooded in rainy weather, Gray said, so a team from the firm he co-founded three years ago, Propel Architecture, designed a covering. The little garden on the school’s west side is open to both neighborhood residents and students, and the PTA decided that it could become more of an educational tool if an outdoor classroom were created. Propel donated design services and finished preliminary plans. Fundraising has begun – though more dollars are needed to cover the cost of construction and materials. 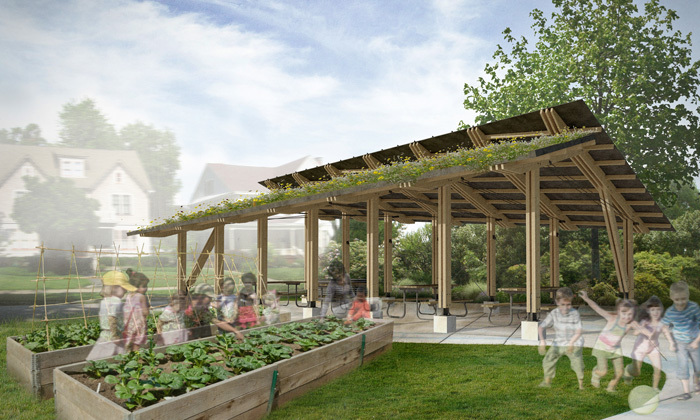 The project will create opportunities to teach kids not only about gardening, but also about sustainable building and making a structure “environmentally conscious,” Gray said. The project started with contributions from students and plenty of input from PTA members, said Eileen Hendrickson, PTA committee chairwoman for the outdoor classroom. About three years ago, students in grades 6-8 created concepts that the professionals were able to build on, she said. Propel has provided leadership via “constant attention and feedback over the course of the last year,” Hendrickson said. Developing the drawings for design and engineering of the outdoor classroom and garden has been a tedious and time-consuming task, Hendrickson said, and Propel has been a guiding force. Hendrickson said she hopes that Propel’s involvement will encourage other design firms to get involved with community projects. But construction costs money, Gray said, and the Vernon School project will receive none from Portland Public Schools. His conservative cost estimate is about $50,000, but that would include donated materials and reliance on volunteers to contribute some of the labor. Hendrickson said a general contractor is needed, and she is hoping that a local construction company will contribute some man-hours. Donations of cash as well as materials to the Vernon PTA are tax-deductible, Hendrickson said. Anyone who wants to help can contact Gray at lucas@propelstudio.com. “They can contact me and I’ll put them in touch with the right people,” he said. Project construction is just the beginning, Hendrickson said. She hopes the outdoor classroom will become an evolving space based in part on input from future students. --- To Download a PDF of this story click here. Custom Residential Design - Construction Update! Here are some quick construction photo updates for one of our custom residential design houses in Portland, Oregon. Together with our client, we created this unique and sustainable home. We designed this ADU a couple years ago and construction was completed last summer. This spring the landscape was updated as the last step! We also have a few ADU renovations that are complete, and 4 new ADUs under construction. Still, this is the one that got the ball rolling. Thanks to Brendan for being a great client! Cut away view of a 2-level, spatially efficient ADU. When thinking about building ADUs (Accessory Dwelling Units) it is imperative to not think of them as full houses. That is the first thing you need to realize when deciding to build one of these Accessory Dwelling Units on your property. It is often difficult for clients to make informed decisions that seem like sacrifices to their normal lifestyles when conceptualizing the layout of a new ADU. Space is at a premium and it is necessary to consider smaller appliances, less storage, and less stuff. As we have been working with a variety of clients on ADU projects over the past year we have been gathering appliances and other space saving tricks that we highly recommend considering. When considering kitchen layouts it is important to understand that there will be minimal counter space. It is usually difficult to fit in large islands and other features common in contemporary kitchens. However, there are a few ways to maximize counter room by scaling down the appliances you are used to. The biggest space saver is by rethinking the fridge. Considering only one or two people max will be living in an ADU there is no reason to have a full, family sized, refrigerator. It is easy to allow the grocery store to store your food and thus save space within the dwelling. It does mean a change of lifestyle, shopping more frequently for one or two meals at a time rather than large shopping trips. This can also help save money by reducing the amount of food that goes bad, ending up in the compost or trash. To address these issues we highly recommend under the counter, drawer style refrigerators. They are simple, elegant, are easy to access and allow the counter to be extended over it. It can even be finished to blend in with the under-counter cabinetry so it doesn't stand out as an appliance but rather blends in with the kitchen aesthetic.They are a bit more expensive than your standard fridge but in our opinion they are worth the investment to increase the usability of the kitchen. Another kitchen related decision is whether or not to include a dishwasher. Again, it is our belief that small living doesn't necessitate all of the same conveniences we are used to in full sized houses. We feel that with smaller spaces and less people, there will also be less dishes and kitchen mess. For this reason we suggest removing the dishwasher altogether. It is an added expense and takes up a lot of space that could be better used for storage. However, if you can't imaging living without the modern convenience of a dishwasher than we again recommend a smaller sized, drawer style unit. This takes up much less space than a standard dishwasher and can also be blended in with the cabinetry materials. Combining an under counter fridge, small drawer style dishwasher, as well as considering a extra narrow, apartment style stovetop/oven can make compact kitchen more efficient and usable. Counter space is always at a premium in any kitchen layout and these small tricks or lifestyle decisions can make a huge impact on the livability of the space. The other appliances that are challenging to accommodate in a small living space are the washer/dryer units. We almost always recommend stackable units and are now even suggesting that clients invest in a 2-in-1 Washer/Dryer combo, which one client recently did. Even though stackables save floor space, every inch of volume needs to be efficiently used in an ADU. The vertical space above a 2-in-1 combo can be better used as a linen closet or storage for detergent and other items. In the Sustainable Portland ADU we had to fit the laundry under the stairs and thus a 2-in-1 unit was the only option. This downsizing must occur beyond just appliances. Rooms, closets, furniture also must be conceived as smaller and more efficient than what we are used to in full sized homes. Whittling down our personal items, like clothes, linens, books and other accumulative things is a must if you are considering moving into the ADU. Otherwise, you have to assume any tenants will be doing a similar purge of personal belongings. Closets will be small, necessitating less clothing. Beds should be in the Double (or Queen size max) to fit comfortably in a small bedroom. Loves-seats might replace full couches and small tables are chosen over full dining tables. To make an efficient ADU built-in shelving, creative cabinets and hidden storage can be incorporated throughout the design. We recently designed a fold-out murphy bed so a room could double as a bedroom and office. We have designed built-in cabinets below staircases, fold up benches with storage below for dining areas, and multi-tiered closets with built in dressers. Each client has unique needs and the storage throughout the ADU needs to creatively solve their specific challenge. Here is an excellent video by the Oregon DEQ about building Accessory Dwelling Units or "Granny Flats." It offers lots of great reasons to build an ADU on your property, either for rental income, relatives to live in or visit, or even to move into yourself as you rent out your main house. Propel Studio has been designing many of these projects over the past couple years and think they are a fantastic way to increase the value of your property, bring in supplemental income and creating sustainable, affordable housing stock in our wonderful Portland neighborhoods. Throughout Portland, Oregon and the Pacific Northwest, cob (an ancient building technique of mixing clay, sand, and straw) has found new appeal. Associated closely with the Natural Building movement, cob benches, ovens, interiors, studios, sheds, and even entire homes now accent our community. Most recent cob structures carry strong ‘organic’ and capricious’ imagery; evocative of an expressive and whimsical way of building. Though cob has found acceptance among alternative builders and do-it-yourselfers who embrace these features, it remains almost wholly absent from the Architecture community as a whole. Even in one of the most progressive, sustainably minded cities in the country, cob and cob building remain fringe movements. But as a material, cob need not be defined through a certain appearance. This 'alternative' approach to building embodies many redeeming characteristics that most people would embrace. In residential, commercial, and community work, cob’s potential remains largely untapped. Sculpted cob elements can become creative and functional centerpieces in an entertainment space, provide unique seating in a sunroom, or create the focal wall in a restaurant. If we can move past certain preconceptions of what cob has to be, we will find at its core a material fully compatible with contemporary design. This post aims to challenge those preconceptions, explain what value cob can bring to a space, and offer ways for the design profession to embrace this most elemental of materials. The approach to unbaked earth most common in this region is known as ‘Oregon Cob’; the latest in a line of adaptations having evolved over centuries to suit a vast range of climates and cultures. In fact, handmade, unfired earthen mixtures comprise one of the oldest, most ubiquitous building materials employed by humans. Its endemic use spans across Northern Europe, the Middle East, sub-Saharan Africa, South and Central America, and throughout Asia as well. Through the 18th century, cob building became commonplace throughout much of England and Wales. With the onset of the Industrial Revolution, this and other forms of vernacular construction tended to give way to the new, prefabricated materials now readily available. Still, earth building remains in widespread use throughout much the world. And over the last several decades, cob has made a resurgence within England and the United States. Here in the U.S., this revival began off the grid, as an alternative movement lending itself to use in eco-communities and small, unpermitted projects. As interest has grown, so has the push towards bringing cob into the spectrum of ‘accepted’ materials. But even with greater acceptance and understanding, cob’s use within conventional architecture and design remains limited. Cob is ECOLOGICAL (in the very real sense of the word); composed of unadulterated, and, ideally, locally sourced materials, most cob buildings maintain a low embodied energy which don’t require large-scale mining or other destructive practices to obtain. Cob is HEALTHY; in both its final and component forms, cob contains no synthetical chemicals, nor poses longterm concerns for indoor air quality due to off-gassing or VOC’s. This remains true throughout its lifecycle. Cob is SAFE; with only your hands, feet, tarps, buckets, and a few hand tools, most phases of a cob project can be completed without the dangers of power tools or machinery. This means anyone, regardless of age or ability, can learn to safely work with cob - and often they will actually enjoy the process! Cob is FLEXIBLE; and can be made to take on nearly any shape. Unlike concrete, cob is fashioned from its base up, not poured into formwork. This methodology lends itself to asymmetrical and undulating forms, varying wall thickness, custom built-ins, and creative openings all personalized to the specific contexts of a project. Cob is SUBSTANTIAL; its mass has implications both in terms of passive solar heating as with the tectonics of building. Load-bearing cob is structured similar to bearing stone; it likes thick walls that taper as they increase in height, and are strongest at their curves. Openings, vaultings, and niches are all constructed with a similar respect to stereotomy. Cob is FORGIVING; just as with building a sandcastle, until dry, cob can be continually edited and changed as you perfect your work. Even once set, cob does not cure in the way concrete does; there is no chemical alteration to the materials. If allowed to sufficiently soak, cob will turn back into exactly what it was at the time of installation. Cob is IMPERFECT; as with anything handmade, the print of the maker is always left in the final product. Contrast your favorite hand-thrown coffee mug to a factory-made ceramic one. The imperfections vitalize it with character and feeling. Just as with people, our idiosyncrasies define us, make us unique, and ultimately special. Picture your mug again; now imagine living in it! Cob is TACTILE; compare the pleasant physical connection of wood to that of steel. That is analogous to the difference between a cob wall and most fashioned from concrete or gypsum board. Formed earth is warm, inviting, and somehow soft even when it is hard. Cob is INEXPENSIVE; all necessary materials can usually be obtained cheaply. It is however a labor intensive way of building. Under a conventional model, the human hours needed to complete a cob project may outweigh the initial savings. This is one reason many cob projects have been owner built. Sustainability, safety, personalization, and warmth are all commonly sought characteristics by people wishing to build or renovate their home. So why is cob construction mostly missing from contemporary design? There are perhaps several contributing factors, but two stand out in particular. The first is that cob has developed to cater towards a certain aesthetic. Since cob lends itself so well towards organic forms and sculpture, many cob buildings end up expressing these qualities. The effect has been to suggest this is the only way for the material to be used. Although not true, this mentality seems nevertheless to have framed cob’s use within a narrow context. Materials don’t necessitate style, and cob can be articulated as ornately or plainly as the maker desires. This can range from the sculpted animals, trees, or patterns presently common, but could also include a more minimal interpretation, one where the use of sleek lines and subtle textures carry their own power. The second reason comes down to finances and logistics. Although the raw materials are inexpensive, cob itself requires a lot of manual labor. This of course translates into many hours and/or people to produce. As a result, practicing under the conventional building model, a house built from cob could be comparable or even more expensive than a stick-build one. Even someone who desires the intrinsic characteristics that make working with cob advantageous, the added financial burden may still make it difficult justify. To succumb to these concerns would be to miss what could be the real potential for cob within our modern context. A material so positive at its core should not be neglected by the design profession, but embraced and pushed to into new arenas. Here are two scenarios where the use of cob, under the focused leadership of an experienced designer, may be financially viable. Where cob is concerned, there is actually a potential group that might be employed to circumvent those high labor costs; ourselves. Here is how this might work. Your community has decided it wants to add a shade and picnic shelter in the local park. Typically, any funds need to be donated, raised or otherwise obtained to cover every stage of the project including the materials and labor. But what if instead a significant portion of those materials were excavated from the site itself, and the vast majority of labor was donated by the very families whom the shelter would later benefit? Because cob is fun, safe and conducive to large, unskilled groups, the entire building process can become a community event! Families with children, local politicians, students interested in learning, or simply anyone otherwise curious could join in. The experience would be educational, productive, and most importantly social, as it fostered real interactions between people. With direction from an experienced designer/builder, the greatest challenge would become organizational, not financial. After a few weekends, the new shelter would be well on its way, and the beautiful walls, benches, and floors would have been hand-made by the very hands that would continue to use them. The completed structure would add identity and character to the community. A second set of situations looks at using cob and natural building practices as a supplemental rather than driving force within design. For both new construction and renovations, if cob was viewed primarily as a great material to accentuate those special moments in a home and not necessarily as comprising the main envelope itself, associative costs would become less prohibitive. Imagine folding the thermal mass of an elegant cob wall around the wood stove in your contemporary cabin. Your study could enjoy the warmth of a cob floor which sweeps up to form a cushioned window bed mimicking a chaise lounge. Maybe you renovate your standard dining room to flaunt chamfered corners and elliptical walls which bulge around a live-edged table. An accent wall with custom niches and openings could display your praised artwork or travel collections. Or perhaps your favorite room to meditate, which appears rectangular from outside, could actually flow and undulate in ways evocative of nature. The potential here is limitless, restricted only by our creative ability to reflect personality and preference in built form. Accent walls, hearths, window seats, niches, floors, sculpted room transitions, daybeds, deeply set fenestration, room partitions, or even completely reworked larger spaces are all viable targets. So too would outbuildings, additions, or any other number of elements relating to the specifics of a space. Juxtaposing the handmade character of cob with our common repertoire of factory fabricated materials could truly vitalize a space and infuse it with identify. These would, almost by necessity, be truly customized and formed to compliment the lifestyle, habits, characters, and passions of the owner(s). By focusing on elements and not the whole, we could contain their expense without restricting their expressive nature and the aura of authenticity they bring. The true spirit of cob lies in its flexibility, flexibility of form but also in how those forms are articulated. By using cob in combination with and as part of a greater sustainable whole, we open ourselves to its vast, overlooked potential. The use of earth in building is as ‘modern’ as we make it; and depends entirely on how it is conceived. Through challenging current assumptions of when and where cob is deemed appropriate, these possibilities for handmade community buildings and accent architecture become viable. Both scenarios embrace the nature of the material itself and the ways it ‘wants’ to be used. Through these practices and others, we can explore, and redefine the notion of ‘contemporary cob’. Curious about contemporary cob building? Interested in seeing if this unique material might be a good fit for your new construction or renovation project? We are looking for opportunities to explore contemporary uses of Cob in Portland, Oregon and throughout the Pacific Northwest. Contact us for a free design consultation. [soliloquy id="1603"] A scale model of the neighborhood east of Berlin's iconic TV tower was recently conceived by the Year 1 class at Berlin Bilingual School. Doused in vibrant colors and with new buildings sprouting from the children's imagination, this model represents the dreams of our future architects, designers, and politicians. The Junior Architects Project conceived by Jessica Waldera, founder of Kleine Baumeister in collaboration with the AEDES Junior Campus Workshop was a unique opportunity for 6 and 7 year olds to engage their built environment. The ultimate goal was to build a 3D model of the school and it's surroundings; in the process they achieved much more. This was truly a cross curricular project, where the children applied math skills, had geography lessons, discovered the science of mixing colors, and learned valuable lessons in team work. The Architecture Forum AEDES is uniquely focused on exposing architecture and urban design through the local and global community. This international association, who runs a gallery and holds workshops for university students, generously donated their facilities and supplies for the children to engage in the creative rethinking of their school's neighborhood. This project was the culmination of a larger “building” theme at school, where the children at BKIS had been learning about iconic structures around the world, including Berlin, and the elements of architectural design. Equipped with basic knowledge of construction materials, structure and building features, they were eager to apply their junior architectural skills. This exploration into the world of design began with the children analyzing various chairs around the school and discussing their peculiarities and purpose. Using these observational techniques, they embarked on a local scavenger hunt where they photographed their environment, sketched buildings, counted windows, measured car lengths, read street names, took note of colors, shapes and sizes, and democratically decided how to spend 3€ on a sweet treat for 9 people. Next the students were given maps of the city, the country and the continent, which they intently and industriously examined. With the help of their teachers and a street index, they found their homes on a large map of Berlin and marked it with a pin and ribbon measuring the distance to BKIS. Surrounding this chart, which is now a permanent fixture in the classroom, are drawings of the students' homes and their own visionary portrayals indicating their route to and from school. This taught not only map reading skills but also gave the children an understanding of context in relation to the urban environment. This led up to 3 intensive days at the AEDES campus, where the children were able to explore the current exhibit and make use of the studio space. Working mostly at stations and in small groups, the tasks were laid out in a fashion that allowed the children to work freely and at their own pace. On one large table was an enlarged scale map of the area surrounding Berlin Kids International School. Here each child used tracing paper to contour an existing building they wanted to model. They took this outline, cut it out and pinned it to a piece of polystyrene which they then took to the hot wire cutter - the most exciting part of the process. At this station, which was the only one constantly monitored by an adult, the children used the tool to carve out their building, sometimes doing it twice in order to more accurately represent the scale of their structure. The next step was coloring their replicas. Some children used pictures that they had taken earlier in the week to guide them in painting a semi accurate representation but most of them just adorned their models in a color they thought to be appropriate with the attitude that “anyone can leave a building white, only we can make it colorful”. As adults and educators, we had to step back and suspend our conventional preconceptions, allowing the children to be masters of their design. Finally, paper roads were painted, polystyrene trees were planted and water fountains were given life on the model. The climax of the week was a vernissage of sorts in which reporters, parents and peers were present to bask in the children's vision of our future metropolis. The students presented the result of their hard work - including the older classes who created a newspaper of the project, documenting interviews they conducted as well as stories and poems inspired by architecture and the city. The finished model will now be permanently displayed at BKIS. Normally children do not find themselves in a workspace containing pristine white walls, high ceilings and designer chairs, so all tolled their conduct in such circumstances was very commendable. They worked with professionalism, pride and proficiency, and despite longer than normal work days, were cheerful and energetic as always. It was amazing to watch the children concentrate so hard when given the responsibility to use the wire cutter or discuss how best to represent their neighborhood. The significance of a project like this should not be underestimated. The children were able to apply what they learn in the classroom to something very real. They understood why they need to measure or count, why communicating ideas is so valuable and how vital team work is. Moreover, they were able to apply their own special skills and expertise, that do not necessarily emerge in the classroom. The theory of multiple intelligence is truly applied in an activity like this and highlights the advantage of project-based learning in schools. It also gave the students an opportunity to express their creative sides and comment on the state of our built environment. Often architects and elected officials get it into their heads that they know what the best vision for a city is. When offered the opportunity this class of first graders completely re-imagined the city in which they live and gave it a vibrancy lacking in so many cities today. Building Information Modeling (BIM) is a digital 3D model of all aspects of a building including architectural, structural and mechanical elements. It creates a virtual replica of the finished building to allow us to troubleshoot the entire design as well as take accurate estimates of costs, energy use, functionality, and constructability. Revit is a BIM software program that Propel Studio has adopted that allows an entire team of experts, from architects to engineers and other consultants to access and collaborate on a single model. With everyone working within one file it is easy to see what information is missing and what areas of the design need to be focused on or refined. The program saves time by being a dynamic tool that tracks changes throughout the model. If we move a window in the floor plan, the software automatically adjusts its position in the elevation and sections, etc. It also allows quick 3D snapshots and basic renderings so the design team and clients can visualize the project as they make important design decisions. Whether you are a client interested in a great building, part of the building’s design team, or involved in its construction, Revit design software allows the project team access to a holistic pool of valuable information. The information is simultaneously organized in both 3 dimensions and 2 dimensions, and is also dissectible into time, materials, parts and costs. As a project stakeholder involved at any point in a building design, having this information available and being able to see it in these ways leads to better decisions and better results. It streamlines the complex process of design and construction. We have been using Autodesk Revit software in building design and construction documentation since 2006. Prior to Revit we used AutoCad, a program more like traditional hand drafting, which is typically used as only a 2 dimensional program. Since making this switch, we have continued to innovate and adapt our design processes to utilize the tools of Revit and find powerful, cost-saving ways to get mileage out of it’s abundance of quantitative abilities. The design process is all about communication, exploration of ideas, leveraging opportunities and understanding limitations. We start by putting everything on the table, pulling as much information as we can together, then pulling it apart through analysis and reorganizing it to help inform our design decisions. This iterative process continues until the entire team agrees on a final solution. Revit helps us balance the clients needs, budget and schedule, the site’s context and climate, the architect’s design expertise, various consultant’s input and recommendations, and ensures all of this information works seamlessly together to create a great project. Using Revit we are constantly modeling each project in 3D - eliminating the hassles of coordinating changes through independent 2D CAD Drawings. This virtual building is then sliced in order to generate 2D views for common floor plans and elevations. You may think of it as setting up a bunch of webcam’s inside a virtual building so that anytime something changes, all the webcams that are looking at that area will automatically represent the most recent state. If your focus is engineering and construction, having the correct dimensions and coordination is only part of the equation. Revit allows these teams to go further and analyze buildings for energy use, lighting, acoustics, safety, and even calculate volume of materials without leaving the project workflow. We use Revit for any project large and small and love it for the ability to quickly make aesthetic decisions - balancing functionality with quick references to the 3D form from unlimited vantage points. Building Information Modeling with Revit allows us to continually evolve our design, all while maintaining a coordinated document set. Our process can now be more about doing, seeing, and reacting. Managing design, rather than managing change itself.